Making a plain fridge interesting could be viewed as a challenge. But not for Perth Graphics Centre. We’ve taken an ordinary display fridge and turned it into something very unique. One of our regular customers, The Smoke Shack, brought in this tired old refrigerator and asked us to make it stand out. Using high quality cast vinyl, vibrant inks and a high gloss laminate, our team of designers, printers and installers have brought this fridge to life. 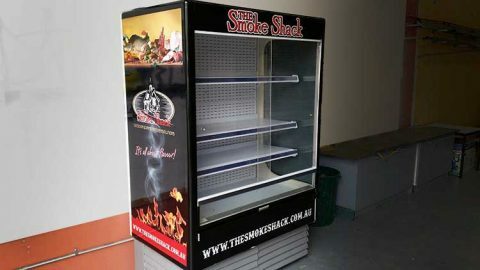 So rather than being stuck with something plain and boring, why not use Perth Graphics Centre to enhance your displays? Whether it’s point of sale, posters, banners or fridges, we can do it all. Click on our contact page to get in touch with us and run your ideas past us. We’ll be ready to chat at any time.